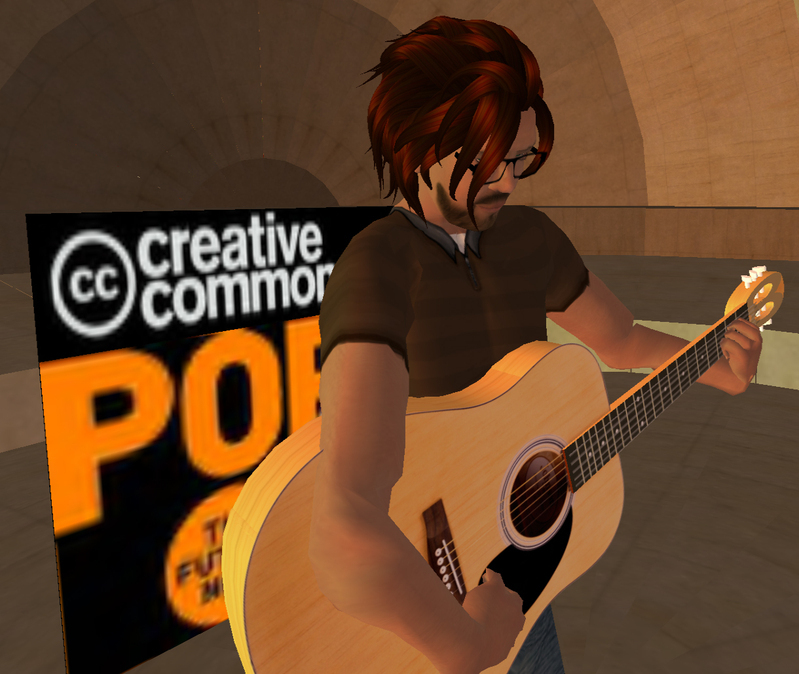 All the details you need for catching Coulton's 5PM Thursday appearance are available at the Creative Commons SL event wiki. I had a chance to interview Coulton/Coalcliff last week, and catch him in-world for an impromptu photo shoot that was occasionally interrupted by a brain-hungry member of the undead. After the break, Jonathan Coulton on everything from writing "Code Monkey" to being a Contributing Troubadour and a CC musician, to collaborating with Hodgman, to creating his zombie anthem "Re Your Brains"-- and performing it with actual zombies onstage. 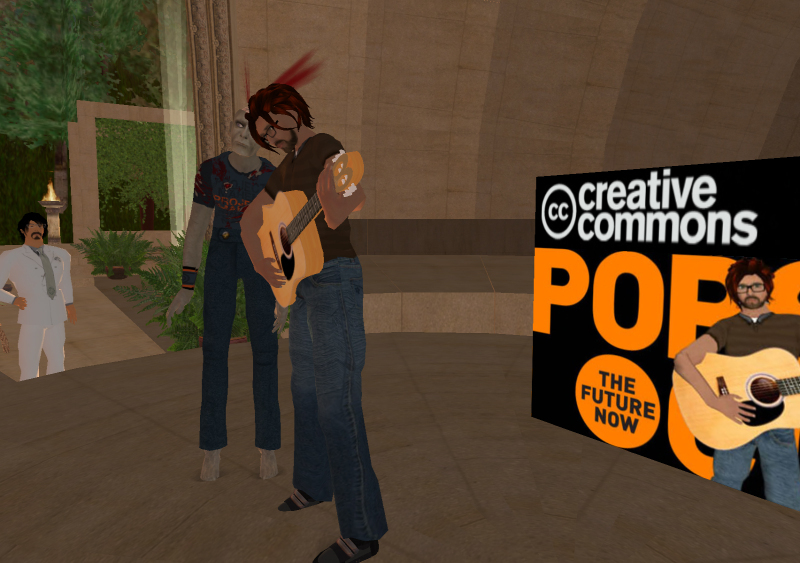 As I remember it, I was on the phone with Popsci web editor Megan Miller, who happened to be chatting with her friend who works with Creative Commons and somehow the subject of Second Life came up. (You know, we often talk about the future, Megan and I. We work for Popular Science-- that's our job.) We thought it'd be fun to see if we could do a concert in SL, and then the wheels started turning. 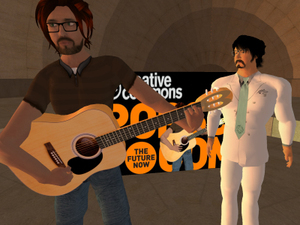 I think Second Life is an amazing glimpse into the future-- hanging out in-game, you can just imagine how over the next decade or two, worlds like Second Life will become more and more integrated into our daily lives. 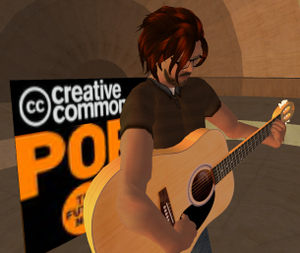 I love the way Second Life lets you own the intellectual property you create in game-- I'm a big fan of Creative Commons, and it's nice to see a company who understands that locking down every little bit of content is not always the best way to go. I'm also really into non-traditional ways of becoming a rockstar, and it's thrilling to see that there's a whole world of artists and fans in there. I was performing at a futurist/technology conference in Maine called Pop!Tech and found myself at an after hours poker session with some Popular Science people. Someone suggested that I write a theme song for the magazine-- I thought it was the whiskey talking, but a few weeks later when presumably everyone had sobered up, they told me they had put me on the masthead as "Contributing Troubadour." So I did a couple of podcasts for them, which incorporated some theme song-ish music, and then later they commissioned me to write a 5-song album to go with their September 2005 issue-- each song based on an article in the magazine. And now I do a weekly interview podcast for them-- The Popsci Podcast from the Moon. PopSci makes me do all the podcasts from their satellite office on the moon-- Lunar Base One. I guess they think it sounds futuristic. But for the purposes of this concert, they've allowed me to return to Earth for a little while, so I'll be in my Brooklyn lair with a couple of laptops and some microphones. I'll plug a mic and my guitar into a pre-amp, which will go into Garage Band on a laptop, and from there Nicecast will stream the audio out to the Internet. From there I don't know what happens, a team of experts is putting that all together, but I think it has something to do with wires. About a year ago I quit a day job I had writing software for a small company in Manhattan. It was a fun job, but it was time for me to leave. I used to use the term "Code Monkey" when I was talking to a client who was asking difficult questions that I didn't want to answer: "I don't know, I'm just a Code Monkey." And there's something to the idea that when you're writing software, even though there's room for creativity, you're still working within someone else's parameters, trying to make this thing that someone else wants you to make. Sometimes you do feel like a monkey dancing to someone else's organ music. But the song is VERY loosely based on the job-- I was never anywhere as bitter and sad as the song suggests, I was not in love with the receptionist, and I did not have a boring manager named Rob. My manager was never boring. It's gone very well for me. At first, even though I was all fired up about the possibilities of CC, I still had that panicky lizard-brain fear about file sharing. I can understand why it's a hard thing for people in the industry to get over-- I totally sympathize. But at least for someone in my position, it's the best thing I could have done. Every month I get more traffic, more donations/sales, and more fans. I'm quite certain that having a CC license on all the music has really helped that process. If someone who's never heard my music before gets a free mp3 (or twenty) and likes it, chances are they're going to pass it along to some friends, blog about it, maybe even make a music video for it. Each one of those outcomes means more exposure, more fans, and more chances for people to pay me-- something that wouldn't have happened as easily if the music was all locked up with DRM and the full battery of copyright restrictions. Absolutely-- it's always a pleasure to find a pocket of people who appreciate songs about math and squids and zombies. I'm sure the show on the 14th will be plenty of fun, so I expect that I'll be back soon. John and I went to college together, and have been friends for many years. John created the Little Gray Books lecture series, a live reading series/variety show that we used to do in Brooklyn, Williamsburg, every month-- I would write a song to match the theme of each show. When he started promoting his book, it seemed like a natural thing for us to put together a little act that we could do instead of a plain old ordinary reading. John calls it a "two-man, one-man show." I wear a coonskin cap. We've also done some podcasting together, and of course the reading of the 700 hobo names that's floating around the web. Well, I can tell you that a lot of the Thing a Week songs haven't made it into the live repertoire yet, just because some weeks I write them so fast I don't ever learn how to play them. But the big hits will be there-- probably you will hear your favorite. Let's just say, if you are a fan of zombies you will not be disappointed. The first line of the chorus just came to me out of nowhere, along with the idea of a zombie who's just trying to be reasonable and doesn't understand why the living are so freaked out about having their brains eaten. The idea to make Bob the zombie an annoying former co-worker came a little later-- it just helped to make him extra horrifying, because you just want to punch him in the face. Usually when I do this live I get the audience to sing along like a hoard of zombies during the chorus, but that obviously won't work in SL. It was [event coordinator] Zenigma Suntzu's idea to get a couple of zombie avatars and have them shuffle around onstage, which I think is even better than a singalong. I had the opportunity to hear a bit of jonathan's rehearsal and I'm definitely looking forward to the show. btw, there will be a creative commons tee and a popsci.com jacket designed by me (nocturnal threads) as well as two neat SL books on hand at the show - FREE :) just look for the sign and pay it 0L. 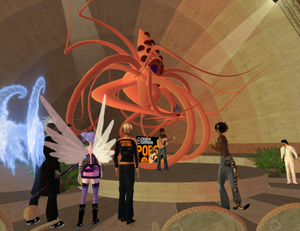 I must say concerts and events of this nature occuring in SL are kinda exciting. weeeeeeee! Super excited about this concert! Please perform "baby got back"!!! Pleasepleaseplease. Damn! I can't make it in world for this (still at work in RL) but I have tremendous admiration and respect for JoCo. You guys are gonna have a blast. 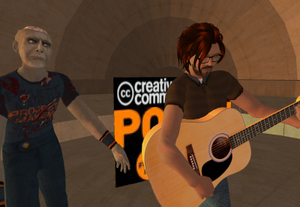 Creative Commons will be sponsoring a machinma contest for the CC licensed video that best captures the 'spirit' of the event.